Take a peek in your closet, and you might find a long wooden broom for sweeping up dust or offering rides to witches and wizards. For broom maker John Spannagel of Hidalgo, Illinois, brooms are more than just a pantry item. They’re a labor of love, made with a special ingredient: broomcorn. Broomcorn is a type of ornamental grass used to make specialty brooms, a passion Spannagel discovered nearly three years ago. The retired construction worker makes roughly 50 brooms a year and tours at local farm shows. 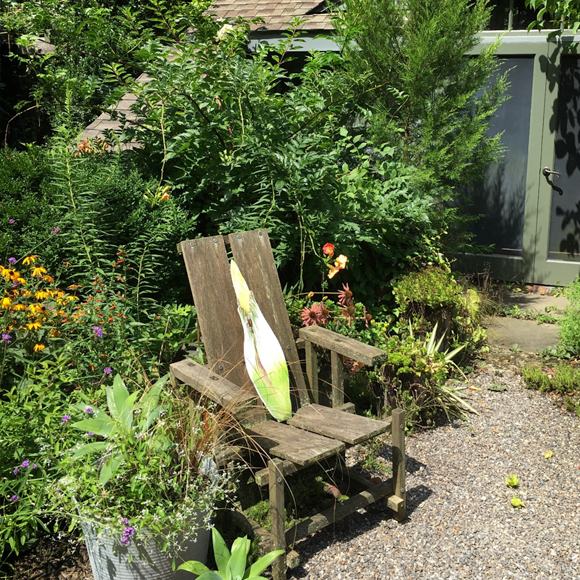 As part of the Chicago Botanic Garden’s Harvest Weekend, September 29 to 30, Spannagel will bring his broom-making machines to the Garden to demonstrate broomcorn broom-making. Broomcorn (Sorghum vulgare var. technicum) is an annual ornamental grass. 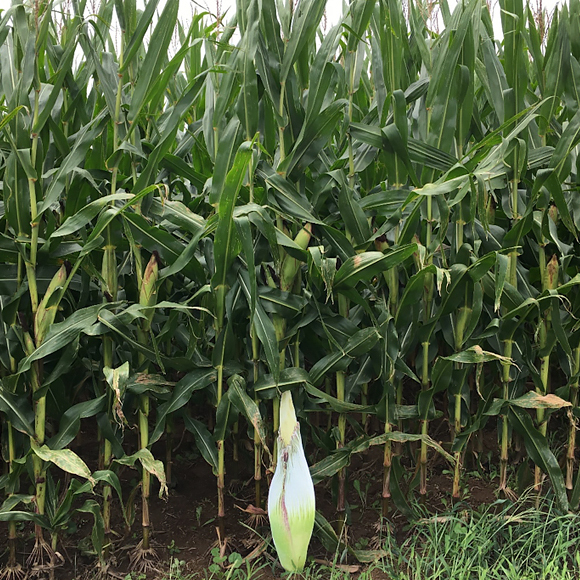 It has no “ears” or “cobs,” and it can grow anywhere from 12 to 14 feet tall. 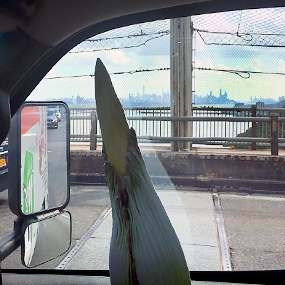 Broomcorn seeds are planted in the early spring, and stalks are harvested in mid- to late August. The long woody stalks have tassels of flowers and seeds at the tips, which are removed during broom-making. You can find broomcorn growing in the Garden’s Regenstein Fruit & Vegetable Garden. 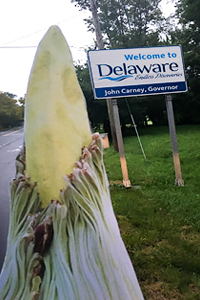 Where does broomcorn come from? Broomcorn originated in central Africa, where it eventually spread to the Mediterranean. Benjamin Franklin is credited with first bringing broomcorn to the United States in the 1700s, says Spannagel. Commercial production of broomcorn flourished in Illinois, one of the leading producers of broomcorn in the 1860s. Nearly a century later, commercial broomcorn production slowed to a halt due to low demand and labor-intensive harvesting methods. How do you make brooms with broomcorn? Broomcorn broom-making is a lengthy process that starts with planting broomcorn seeds in the spring. When broomcorn is harvested, the stalks are run through a threshing machine to remove their seeds. The stalks are then laid on a broomcorn crib to dry for a few weeks. Once the stalks are dried, Spannagel uses broom-making equipment, including an antique kick-winder machine to wind straw around a broom stick; straw cutter; and broom press. How much broomcorn is used to make a broom? Spannagel orders his broomcorn from a supplier, and uses seven bundles of straw to make a broom. It takes about 45 minutes to make each broom. “Each of my brooms is a little different, and that’s okay,” says Spannagel. 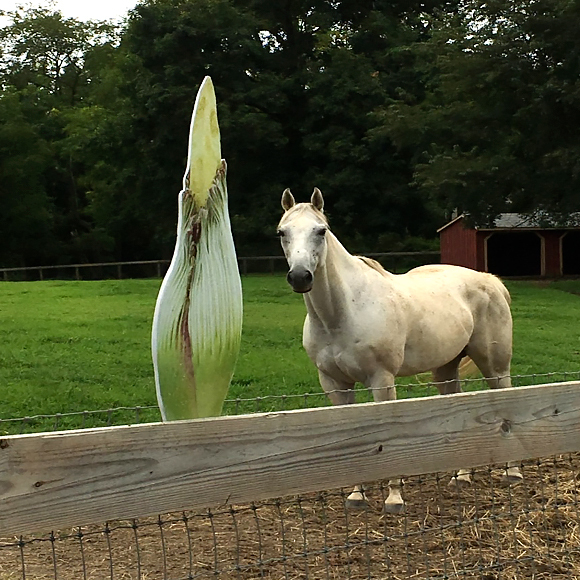 So, what do you do with a broomcorn broom? Most of the people who buy Spannagel’s brooms use them to sweep, but many others use them as decorations. Spannagel says as long as you take care of your broomcorn broom, it should last up to 15 years. Be sure to store them upside down or hang them so that that the bristles don’t bend. And always keep them dry; if the broom gets wet, let them air dry. Hear more and see Spannagel’s broom-making in action at Harvest Weekend, September 29 to 30, at the Regenstein Fruit & Vegetable Garden. Summer won’t be over for a while in my book—not as long as there are dragonflies around. I think I’ve seen more dragonflies this year at the Chicago Botanic Garden than I have in the past ten years combined. The quick, strong fliers seem to be everywhere. Eastern pondhawk dragonfly, female. Most dragonflies have very different-looking males and females. This one was in the Native Plant Garden. Photo ©Carol Freeman. Some of the dragonflies migrate south toward the Gulf Coast through September and maybe beyond. With the help of citizen observers, scientists are studying the migration patterns of this fascinating insect, which has a near 360-degree field of vision that helps it avoid predators. Blue dasher dragonfly, female. She looks very different from her male counterpart. Photo ©Carol Freeman. Blue dasher dragonfly, male. Hanging out on the waterlilies. Photo ©Carol Freeman. 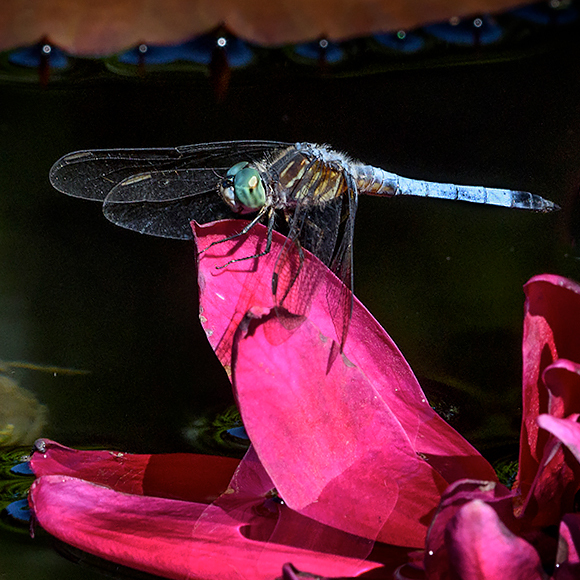 Dragonflies and damselflies, both in the order Odonata, can spend several years as aquatic nymphs before they emerge into the beautiful winged insects we see on land, which is why you will often see them around water. They are fierce hunters in both stages. They don’t bite or sting humans, though. The common green darner dragonfly is one of the first dragonflies to emerge in the spring, and one of the species that can be found migrating in huge swarms in the fall. Photo ©Carol Freeman. Dragonflies can be found here from March through the first hard freeze in the fall. 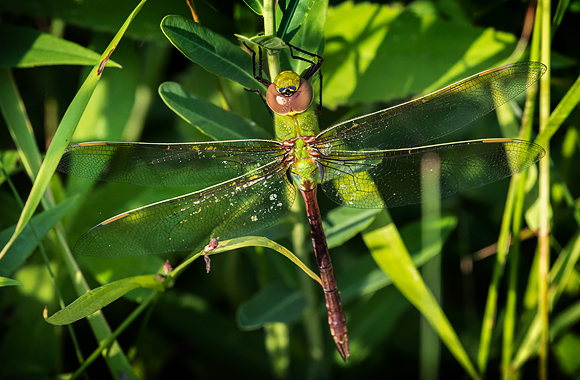 Right now, you might even be lucky to find yourself in the middle of a migrating swarm of green darners, black saddlebags, or wandering gliders as they head south. About 90 different odonates can be found in the Chicago area. Each one is a delight to behold. 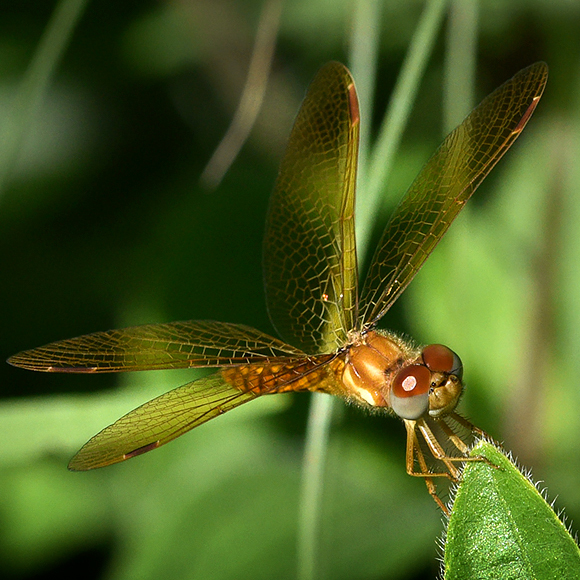 Eastern amberwing dragonfly, male. This is one of the smallest dragonflies in our area, at just more than 1 inch long. Photo ©Carol Freeman. 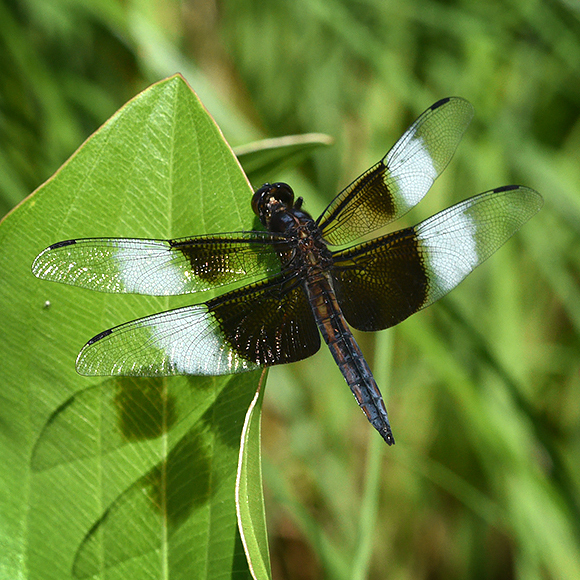 Widow skimmer dragonfly, male. This is one of the larger, flashier dragonflies, and it is easy to identify. Photo ©Carol Freeman. 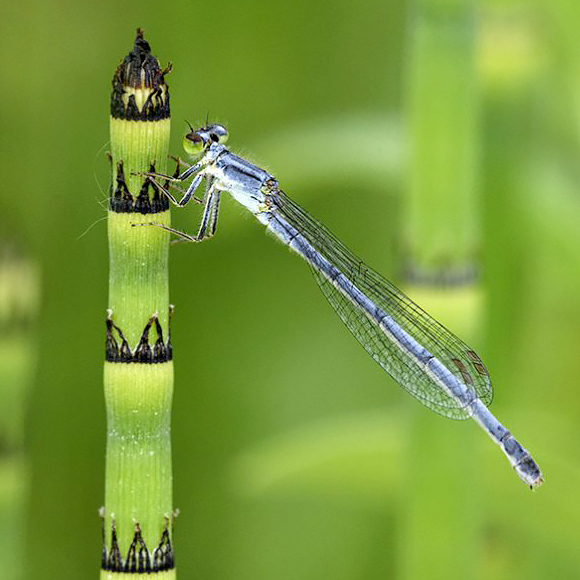 Eastern forktail damselfly, female. 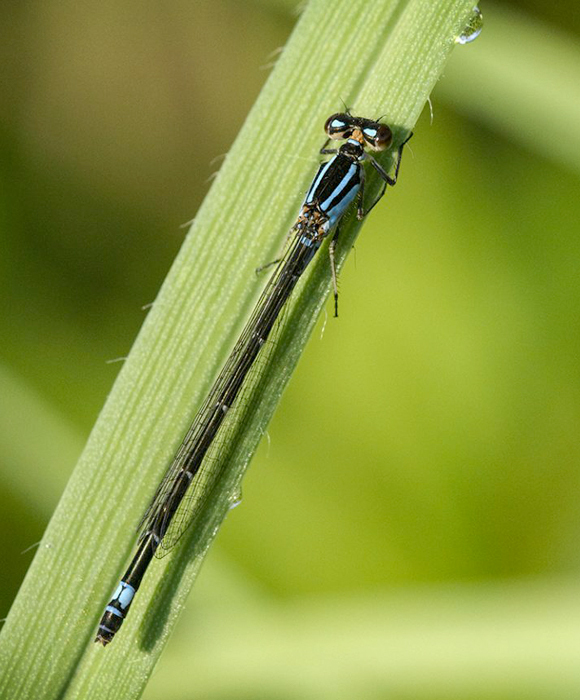 This is the most common damselfly in our area, and it can be found in the Dixon Prairie. Photo ©Carol Freeman. 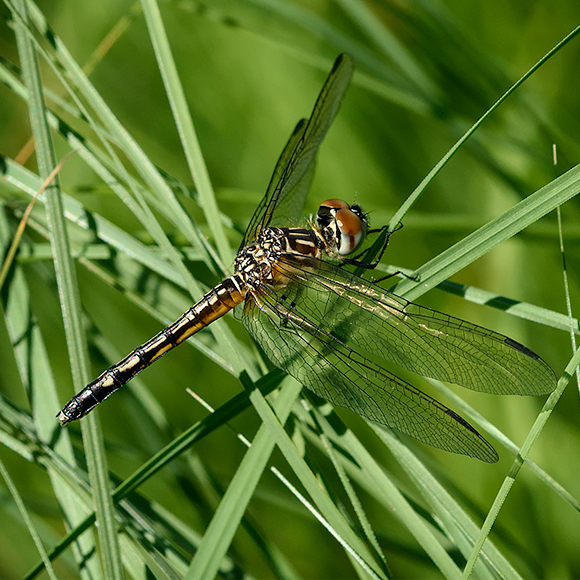 Dragonflies are territorial and will often chase off other dragonflies, only to return to their favorite perch. A favorite place to find them at the Garden is around the waterlilies and lotus blossoms, but you can spot them throughout the 385-acre grounds. 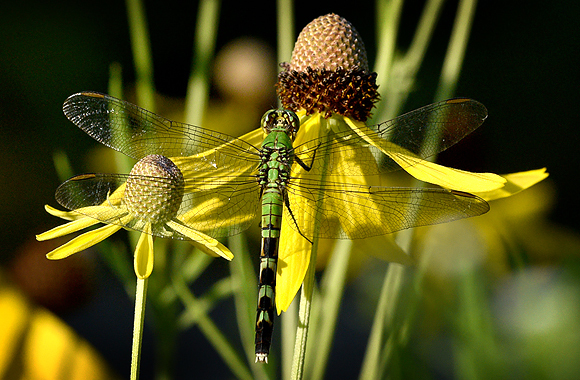 Drop by and keep an eye out for the dragonflies near the late-summer blooms. Skimming bluet damselfly, female. This is a small, delicate damselfly found in the Dixon Prairie. 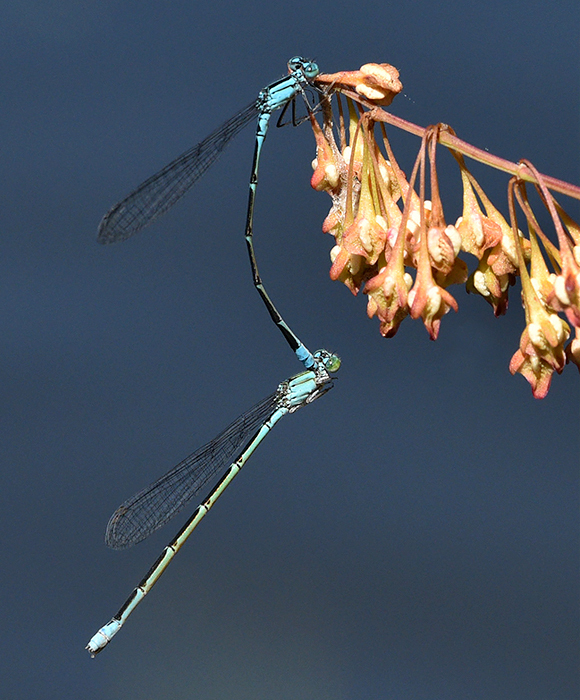 Slender bluet damselflies, getting ready to lay some eggs. I found this pair along the shoreline next to parking lot 5.